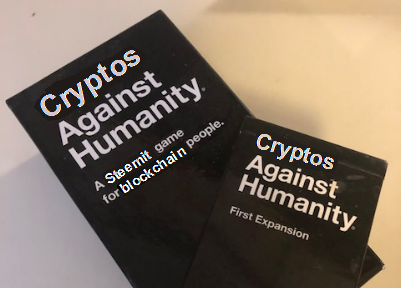 Definitely *Not* A Cards Against Humanity Contest - Week 9steemCreated with Sketch. Hello again, contestants! We made it through Week 8 in spite of the incessant campaign ads and calls (if you're in the USA anyway) and now we're back for Week 9 and a little peace and quiet after Tuesday. Some of your answers were very clever, others were downright random (in a funny way!). It was tough to pick, but I went with the most useful. by @fromage. Congratulations! If that doesn't help newbies get Curied, then they are truly beyond hope. by @mimismartypants. Congratulations on winning this two weeks in a row! 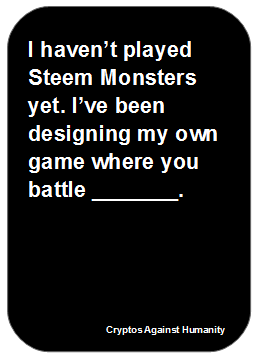 I haven’t played Steem Monsters yet. 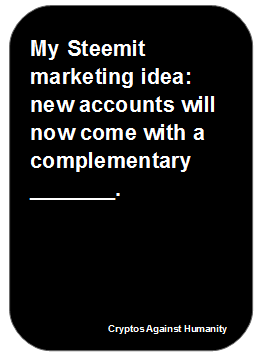 I’ve been designing my own game where you battle _______. @muscara has earned 0.897 STEEM. 0.88 STEEM from the creator of the bounty and 0.017 STEEM from the community! ...a moth of the family Zygaenidae. Whoop whoop!! I'm on a role here!!! Let's try for a hat-trick!! Congrats to @fromage and @sparkesy43 as well!!! And thanks @dollarsandsense for my prize!! ...the Royal Caledonian Curling Club. This is amusing in a tragic way, to a New South welsh woman who has found it almost impossible to house her family. NSW has seen it's first downturn in real estate in a very long time. This is feasible, the banks have used every other tactic to avoid the inevitable. When the GFC hit everyone else, our bubble just kept ballooning. We were seemingly immune due to... I think the claim was trade with China and Chinese property investment. I have enjoyed the contest. Sorry for my overly inclusive response, I got carried away and wrote a much longer one which I didn't post, that became a little too wrong even for me. I understand what you mean about the housing market. In Hobart there is a severe rental shortage with ridiculous numbers of applicants for pretty much any property that hits the market. It's crazy. a village and municipality in Jičín District in the Hradec Králové Region of the Czech Republic. Sheikh Ibrahim al-Nama'a is an Iraqi imam. He has a close following in the city of Mosul. He has been cited as an Islamist whose preaching had a political purpose against the occupation in Iraq. Y'know, as opposed to that other game, the one where you battle the dead guys. Your UA account score is currently 2.909 which ranks you at #11188 across all Steem accounts. Your rank has improved 12 places in the last three days (old rank 11200). In our last Algorithmic Curation Round, consisting of 253 contributions, your post is ranked at #128.